Ellie's five months of marathons! Ellie Atkins is running this year’s London Marathon for the Circulation Foundation. Bupa UK Health Adviser Megan Sullivan shares her five top tips on staying mindful this year. Read Saskia Craine's blog (Health Adviser, Chancery Lane Health and Dental Centre) here. Helen Baxendale presented at the recent Older Person's Fellowship Conference 2017. Jon Edmondson was recently invited to judge an award at the COPA 2017 Exhibition. Reflections on the recent Clinical Update Day and 'OurBupa Clinical Network' event. 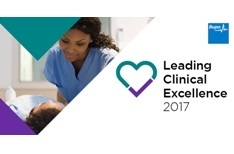 Follow the 22 delegates on their journey through the Leading Clinical Excellence 2017 programme. The recent Clinical Network Breakfast was held at Battle Bridge House on Tuesday 4 April 2017. Greater transparency between healthcare professionals and their patients in needed..
Spot, avoid and treat shin splints. Bupa Health Adviser Stephen Parkinson, give us advice on how to avoid and treat shin splints. Find out about Dr Tesh Amarasinghe's career and achievements with our 60 second Q&A. The first Clinical Network Breakfast for 2017 was held at Bupa House on Wednesday 8th February! ​Read Health Adviser Joel Prowting's blog on Intermittent Fasting. Tracey Carter's blog on the recent 'coaching simulation day' at St Marks Care Home in Maidenhead. We spoke to George Homewood, a Health Adviser Team Manager based in London. Meet Charlotte Tubey who works at Branston Court Care Home in Burton. Meet the Lifestyle Health Coaching team who provide support to our Health Assessment customers. In 2017, Ben is taking on the role of setting up Health Assessments in Citigroup headquarters. The Bupa Staines office choir held Christmas carol concerts during December. Jane Bozier documents her journey of undergoing hip replacement surgery. Lisa Gammalliere has been an Activities Coordinator for an amazing 16 years! Blog update from Kathryn Johnson, Specialist Mental Health Nurse Adviser within UK Customer. Ana is our Senior Sleep and Neurophysiologist at the Bupa Cromwell Hospital. Heidi Wright, the Chef Manager at Branston Court Care Home takes part in our Q&A. On Thursday, we travelled up to Burton upon Trent to visit Bupa's Branston Court Care Home. Sarah Brice, Health Advisor Team Manager, talks to us about her role. I had the pleasure of meeting Dr Michael Musgrave for an early morning coffee and chat. Today we have been meeting with the final group of nurses waiting to come to the UK. We have met more nurses today who are working hard to achieve a pass at IELTs. Katie Thorpe and I are ‎meeting the Filipino nurses who've been made offers of employment. Jemma Batte is one of our Clinical Fellows here at Bupa. L@B – Team Ranchi. My Experience. I was very fortunate to be selected for the L@B emerging leaders program. What an event we had last week in London at the Clinical Excellence event. Last week I attended the Bupa UK Clinical Excellence event. Sharing Best Practice and Clinical Expertise. I was lucky enough to be able to visit St Mark's Care Home in Maidenhead this week. I had the great honour today of attending a thank you luncheon for Bupa from the Youth Sports Trust. A truly person centered home. Whilst Clare goes on maternity leave she looks to use OurBupa to "keep in touch". Talking about dying – it’s a difficult conversation to have. For some people, spending time in their kitchen creating tasty dishes fills them with joy. If you’re looking for a way to get active, the solution might be easier than you think. Did you know that we spend around a third of our time sleeping? Mindfulness – everything you need to know. It’s not uncommon to experience bad breath for a short time.